David E. Kelley is no Matt Weiner. He’s also no Aaron Sorkin, who he’s spent much of his career pursuing in one form or another, but as far as The Crazy Ones is concerned, it’s the Weiner comparison that really matters. Kelley is a writer who thrives on eccentricity, whose shows are only as good as the crazy people at the center of them—and he’s got a doozy of a whacko in Robin Williams. Yet this show hinges on Williams’ ability to pitch like Don Draper, and no amount of funny voices can sell an idea the way Draper’s faux-authenticity manages. It’s a comparison this pilot is begging for, and one that leaves it feeling completely empty as a result. The Crazy Ones wants to be a show about ideas, and about how sometimes the wackiest among them is the best, but this relies on the ability of the central cast to sell more than it depends on an actual script to support them. Williams does his “Look how zany I am!” routine, while Sarah Michelle Gellar is marooned as his straight man. Behind them are some actually accomplished actors like James Wolk and Hamish Linklater, both of whom do as much as possible to salvage the lack of material they’ve been given. Wolk in particular works double time here to sell himself as an ad man, and while he’s as charming as ever, he somehow feels less authentic than he did as Bob Benson, a character who existed as proof positive of the ad man as cipher. The ad at the center of this pilot, and at the center of the series, is one Apple released in the late ‘90s about how sometimes the best idea is to take a risk, to try something crazy in hopes of success. It’s a shame, then, that The Crazy Ones is incapable of taking its own advice. This is a staid pilot full of underdeveloped characters and a plot that seems to have been given literally zero thought. Every actor here gets by on charisma alone, and while there’s a lot of charisma here, it isn’t nearly enough to sell the subpar stunts these characters go through over the course of the episode. In some sense, David E. Kelley is the Robin Williams character, a man of some accomplishment not exactly fit for these times, yet trying and often succeeding through sheer force of will. Kelley’s style of television (he is the creator behind Ally McBeal, The Practice, Boston Legal, and Boston Public, among others) went out of fashion nearly a decade ago. He was a master at the fleet, funny, barely held together procedural in an era where that was the pinnacle of TV. Yet Kelley has always suffered at procedural storytelling, which has lead to his downfall in the last several years. Kelley loses interest in characters and storylines and then drops them entirely. The cast of Boston Legal, in particular, was a merry-go-round of supporting players who would get a few weeks worth of material and then be shunted to the side before disappearing entirely. This pilot may advocate for innovation, but it’s a complete lack thereof that’s held Kelley back for nearly a decade. But really, The Crazy Ones isn’t a David E. Kelley show. 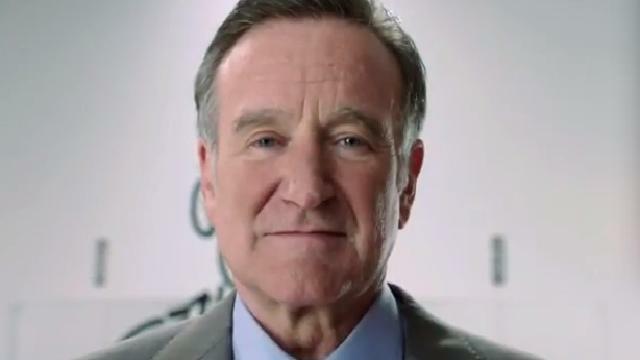 It’s a Robin Williams show. It is clear from early on this pilot was sold on the strength of Williams as a comedian, and while his wild antics and silly voices can work in stand-up or in a movie well suited to his talents, it’s hard to imagine them playing well on a weekly sitcom that doesn’t feature Williams as a literal alien. In some conception, this pilot is about the relationship between Williams and Gellar, but the latter is so outmatched here, she ends up flailing even as a straight-woman. When he congratulates her at episode’s end, her victory feels more like an invention of the script than a reality. We know she did something good because we know how narratives work, but her triumph feels completely artificial, her character entirely a reaction to Williams’ endless series of tics. What’s amazing is that Wolk actually manages to match Williams for manic intensity. The two have a buddy-cop feel that was inconceivable to me before tuning in. Wolk continues to prove himself as one of the best and most adaptable actors on television, and in an extended improve with Williams before guest star Kelly Clarkson, he proves himself capable of matching one of the quickest comedic presences in pop culture. David E. Kelley is a character man of the first order—take away Ally McBeal, John Cage, Alan Shore, or Denny Crane, and the shows they support are completely worthless. The Crazy Ones offered some promise in this pairing, but all confidence I had was sapped by the fact that the focus was on an entirely different couple—Williams and Gellar. Kelley’s ADD as a writer might mean a shift in focus, but unless he manages to make Gellar work as more than a reaction to Williams, this center isn’t likely to hold. Ultimately, The Crazy Ones feels like a pilot made by someone who knows how literally to make a first episode, but has lost sight of the emotional weight his work is supposed to hold. You can see the comedic and dramatic moments this show intends to land, but few of them are actually effective. The show feels like it might have had time to find itself as an hour long dramedy (Kelley’s general format), but feels squeezed into this slighter frame. Throughout the episode, Williams talks about leaping and finding a net in the process. It’s a good line in a show that feels completelt tethered to tradition. This is a story about people taking risks that seems afraid to do so itself. It’s safe television, which means it might make for good background noise, but is unlikely to resonate beyond its runtime. -“He’s singing lead!” Seriously, James Wolk is exactly as charismatic as this show pretends. -“After you. I insist.” This line alone destroys my confidence. It feels like the great last line to a pilot I hadn’t watched. This is the emotional button on a story this episode didn’t offer me.